Hitech Institute of Engineering and Technology truly believes in enhancing the overall skills of students both – technically and non-technically. GAMBADE is a technical event that majorly aims at assessing the students in their respective domains, through a series of written tests and quiz sessions.¬¬¬ GAMBADE is a pursuit of trivial knowledge that encourages students to achieve academic excellence and increases their awareness of the world around them and make them corporate ready. It has a momentous role to play in developing knowledge, abilities and skills of our professional learners in a more exhilarating way, thereby, replacing the old mundane methodology of inking the papers. The purpose of GAMBADE is to actually test student’s retention and accumulation of knowledge in a real life situation, encouraging independent study and academic excellence, recognizing and appreciating non-traditional values for competition and building self-esteem & pride. 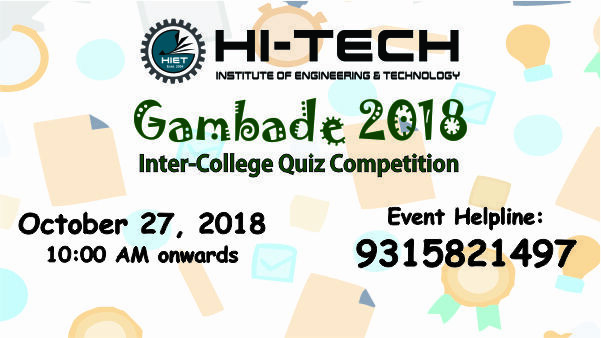 This year GAMBADE 2017 was held on 11th November and students from different colleges participated in the finals along with HIET students to verdict out the best technical talent. Each department organized the quarter finals and semi finals for HIETians and final event on 11th. I am in 2nd year can i applY for this…?